Our hotel in Perth was near a building site, so it was very noisy. I have been noting down (metaphorically) the Australian culture. Australians are laid back and ridiculously nice. I counted about three G’days and about a dozen mates. The clichés are true. Because Perth is so isolated, it is important it has all the essentials so that it is self sufficient. There are literally a dozen Japanese/Korean restaurants and a lack of Italian (although there is a great Italian restaurant in Fremantle). There are a few independent book shops with a huge variety of books and a huge amount of geek essentials. There are two comic book shops and a gaming shop. Of course, I bought a few comics and novels. Unfortunately, our Fremantle accommodation won’t have Wi-Fi so I need some entertainment. The traffic lights are similar to Singapore’s in that they count down how many seconds people have to cross the road. The lights also make noise and have convenient arrows telling people which side of the road to cross. The food as mentioned before is great and there are waffles here! Excellent! The first time I went to the waffle place for breakfast I had pancakes with chocolate chips, and the second time was waffles with Oreos. I had waffles for breakfast in Perth. The first major day trip we did was visit museums around Perth. The Western Australian Museum had great history behind it. There is a temporary exhibit all about the Australian side of World War I with carefully restored photographs and lots of information. In particular, a chest which contained many of the original photographs from 100 years ago was in the exhibition, although of course it couldn’t be touched. The original photographs were by Louis Thuillier and his wife Antoinette, who took photographs of the soldiers when they arrived in France to fight. The Remember Me exhibition – the trunk. The rest of the museum was interesting too. There was a mammal hall and a room all about the history of Western Australian Aborigines and the relationship with the European settlers. It sheds some light on the history of Australia and the people. There is also a very moving section about the stolen Aborigine babies. I think it is important that the Australian government recently apologised about the treatment of Aborigines in the past. People should now learn from the mistakes from the past. 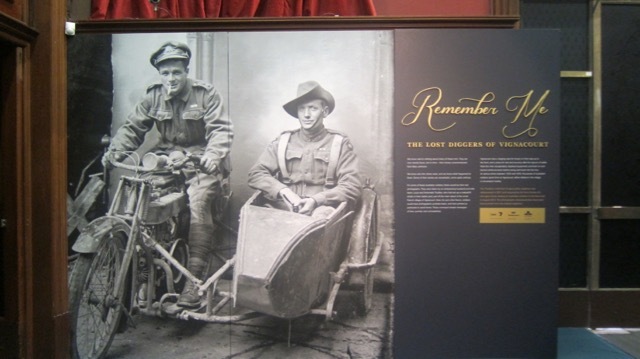 Remember Me Exhibition at Western Australian Museum: The lost diggers of Vignacourt. We also visited the old court of Western Australia, which is now a museum. It had some information about old court cases, especially cases about Aboriginals clashing with Europeans. One case was an Aborigine man charged with the murder of a European in revenge. In the laws of the indigenous people, killing someone in revenge is not against the law, but the European court considered it a crime. The defence lawyers said that Aborigine laws could not be applied to a European based trial. The museum also had historical items about the courthouse. The next day was zoo day. The main reason of going was to see Australian animals I wouldn’t be able to see in the wild (dingoes, Tasmanian devils, saltwater crocodiles). There were many free roaming kangaroos and wallabies. As well as the Australian wildlife there were many different types of animals, some of which, like the tiger, were endangered. I donated 5 dollars to the zoo in their conservation program. As we arrived off peak time, the zoo was not brimming with visitors, so the whole day felt very relaxed. We also had a trip to The Royal Mint museum in Perth, which explained Perth and Western Australia’s gold history. The guide demonstrated how gold was made by pouring melted gold into a mould and cooling it, turning it into an ingot. It was interesting to see some of the gold nuggets found in Western Australia and explore why people were obsessed with it. They also had a real gold bullion. The museum also had the world’s largest coin, worth 1 million dollars. Yesterday spotting kangaroos was finally achieved. They were on a little protected nature reserve called Heirisson Island in the middle of the city, and they were completely wild. Thankfully they were used to visitors so were calm when we approached them. From the park the Perth skyline could be seen. We walked for 4-5 miles that day, including a visit to Queen’s Park, but the walk was worth it. I didn’t touch the kangaroos because they are wild and I was worried that they might retaliate. Perth – Heirisson Island: we saw some kangaroos in the city. Today was the first train trip to Fremantle. It felt more vibrant with more markets and quirky buildings than Perth. It felt like an English town. Mum compared it to Brighton, except without the endless cars, awful traffic and lack of anything (not a Brighton fan here. Been there once and didn’t like it). Tomorrow we’ll be moving to a Fremantle accommodation, sans Wi-Fi as I’ve mentioned. Hopefully I’ll explore the city more. wow Ben – you seem to be having a great time. I know nothing about Perth so really enjoyed your post. I hope Mum found some Fair Trade goods for sale. It sounds like the long journey was very worthwhile. I knew a bit about Perth, but I am surprised at the lack of Italian restaurants. Freemantle sounds brilliant – the only thing I knew about it was the prevailing wind called the ‘Freemantle Doctor’ for reasons that I do not understand. Also, it was the venue for the Admiral’s Cup race for super-yachts (the ones with sails, not the billionaires playthings). What a great post Ben. I’ve never been to Australia, so it’s really nice to read all about your adventures. Thank you for sharing so much detail. I think your story about the court case is fascinating, and a really good example of the issues between the European settlers and the Aborigines. It’s very sad that in mots of the countries we inhabited, we dismissed the rights and needs of the indigenous people. If I understand correctly, in New Zealand it was a little bit different and the Europeans worked with the Maori, but it’s a shame the same can’t be said for Australia and America. I hope you have a nice time in Fremantle, despite the lack of WiFi. It sounds like a lovely place. In fact your whole post makes Australia (well, Perth anyway), sound very friendly, welcoming and interesting. Perhaps I should start planning a visit! Enjoy, and I’m looking forward to reading your next update.